Simply the best wedding favours ever. 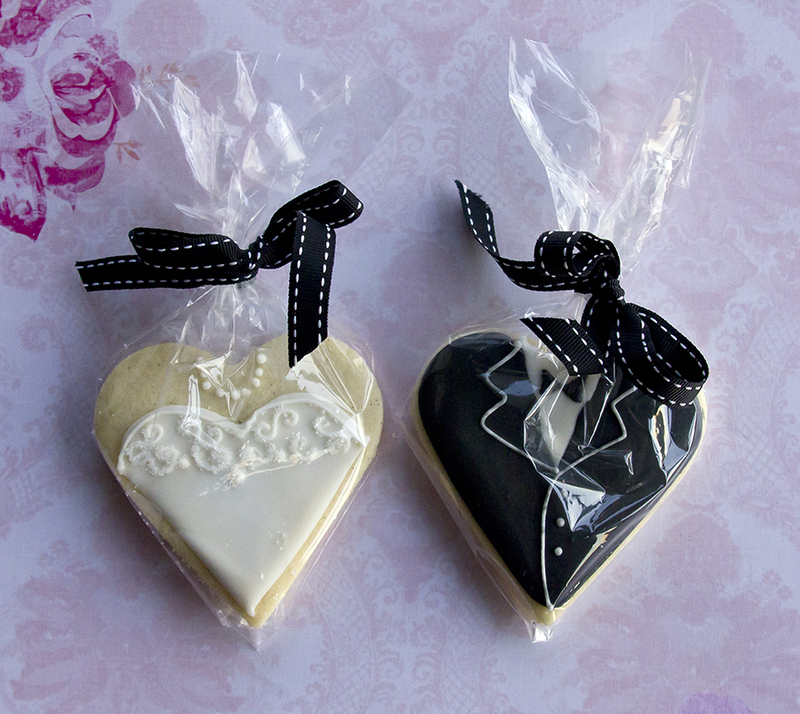 These cute heart shaped Bride and Groom cookies are quite simple to make but can be quite time consuming so please leave yourself some extra time so that you don’t end up with a rushed job! 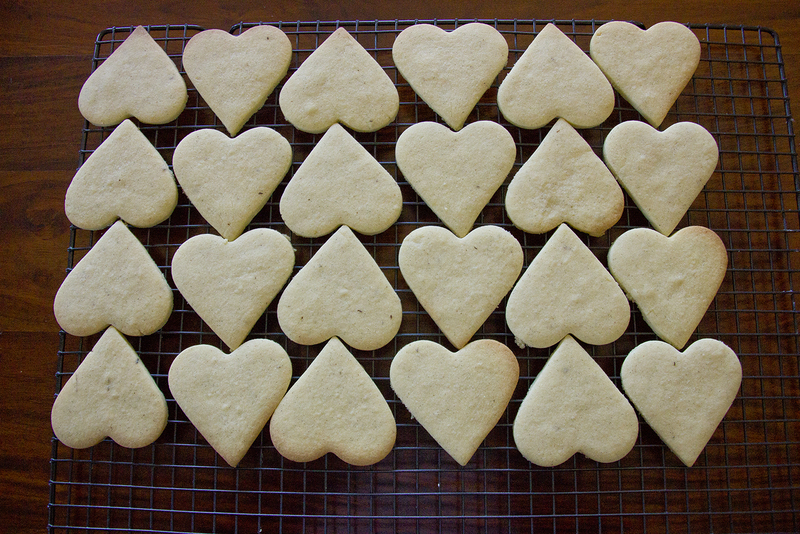 The recipe below is for 24 heart shaped vanilla iced cookies each 8 centimetres high. The cookies are iced using the ‘Outlining and Flooding’ technique which is simple to learn. The outline works as a dam or wall to hold the runny icing which you use to fill (flood) in the main parts of the cookie. Add the flour and mix on low speed until a dough forms. Cover with cling and place in fridge for at least 1 hour. 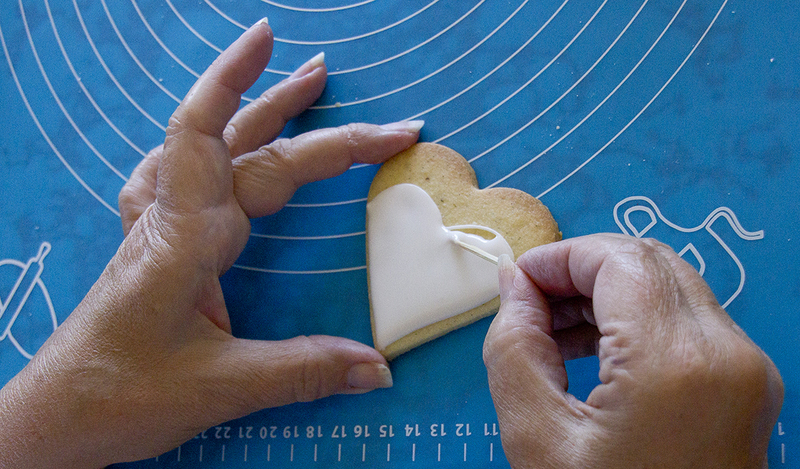 Cut out your heart shapes, then, using a palette knife, lay them on a baking tray lined with greaseproof paper. Chill again for about 30 mins. Preheat oven to 190C/170C fan and bake for 10-13 mins, until golden brown at the edges. Beat icing sugar, acetic acid and egg white with electric beaters on slow to begin then medium for 4 minutes for soft peaks. Divide the icing between two bowls with airtight lids. Place lids on until required as icing dries out very quickly. Add white colour and black colour to respective bowls and mix to required depth of colour. I used Americolor gel colour. Add water (a 1/4 tsp at a time) and stir until you reach the thick or ‘outline’ consistancy. To test the consistency just drag the tip of s knife through the surface of your icing, letting the knife go about one inch deep and count to 10. If the surface of the icing smooths over in approximately 10 seconds then your icing is ready to use. If it takes longer, the icing is too thick. add more water. 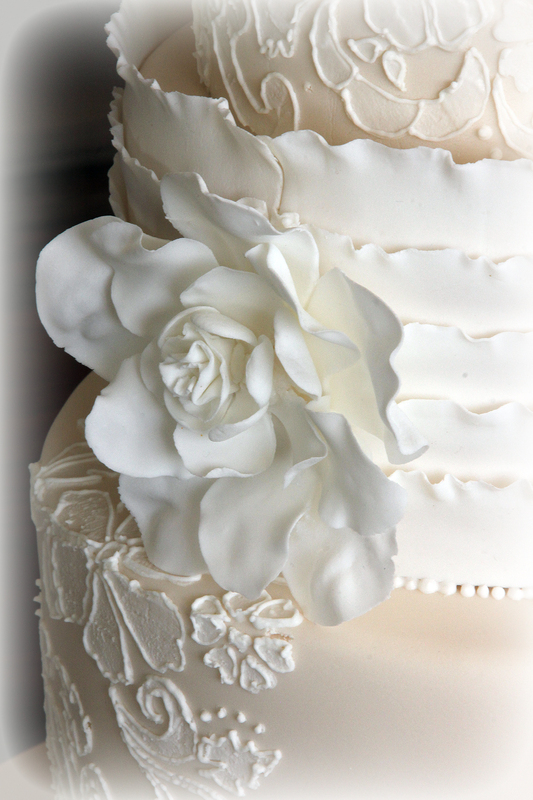 if your icing surface smooths over in less than 7 seconds, it is too runny. Add more icing sugar. When your icing is the right consistency ( i.e. smoothing over in 10 seconds) place a quarter of the icing in a piping bag with a small tip number 0 or 1. Add more water to the remaining icing till it smooths over in 2 – 5 seconds then pour the remaining icing into a squeezy bottle. Thick black and white Royal Icing for ‘outlining’ in bags, thin black and white Royal Icing for ‘flooding’ in squeezy bottles. Cocktail stick for speading the icing and a cup of tea to enjoy. ( N.B. I have 92 chocolate and vanilla cookies here… hopefully you will only have 12 vanilla cookies to pipe). 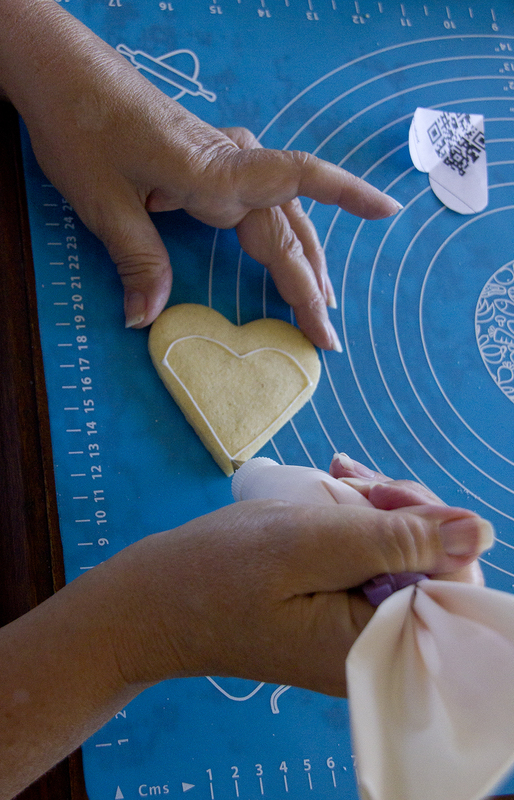 Outline your cookies first and leave at least 15 minutes before you flood the inside of the ‘dam’ (outline). When putting light and dark shades together as we are here (black and white), it is best to wait a few hours in-between so that the colours don’t bleed into each other. 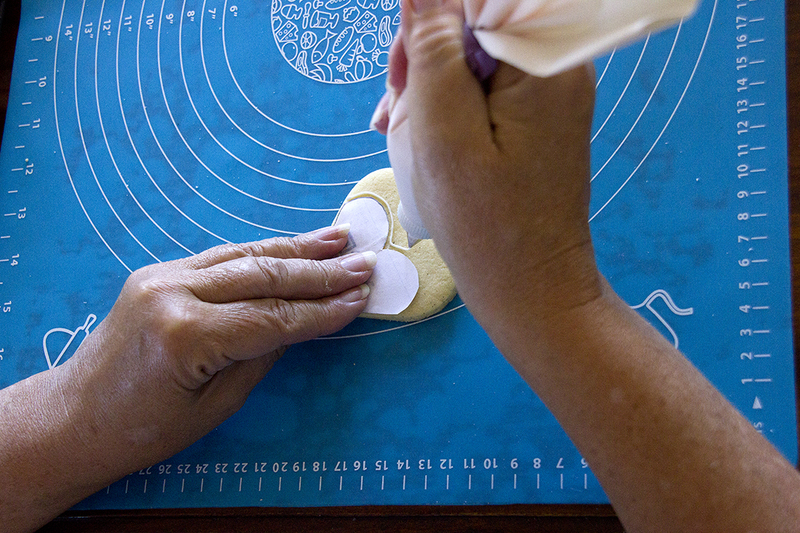 To outline the cookie hold the bag at 45 degrees and position the tip on your cookie. Put enough pressure on the bag so that the icing comes out and you can start moving in the direction that you want your icing to go. Start lifting the piping bag till it is a few centimetres above your cookie and the icing just falls in a continuous line onto the cookie below. Come back closer to the cookie at corners and when finishing also reduce or stop pressure on the bag to go more slowly or to stop. 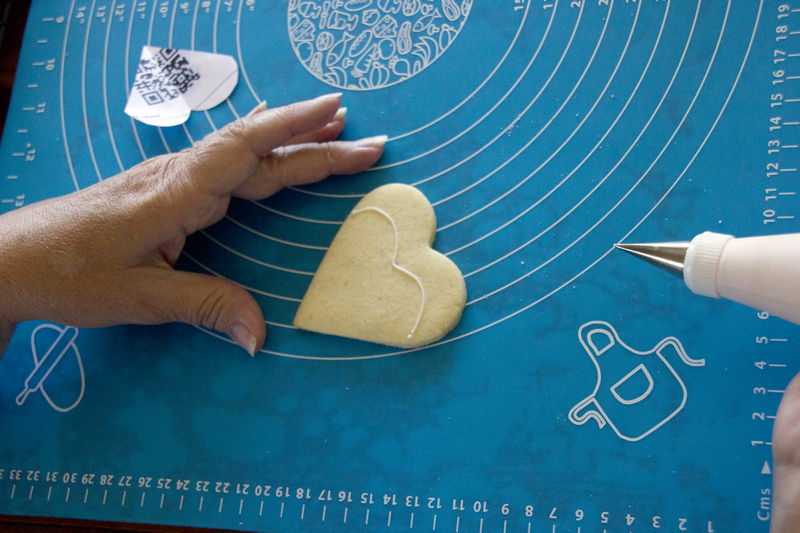 Cut out a small heart shape template in thin card or paper to help get the correct outline of the dress. 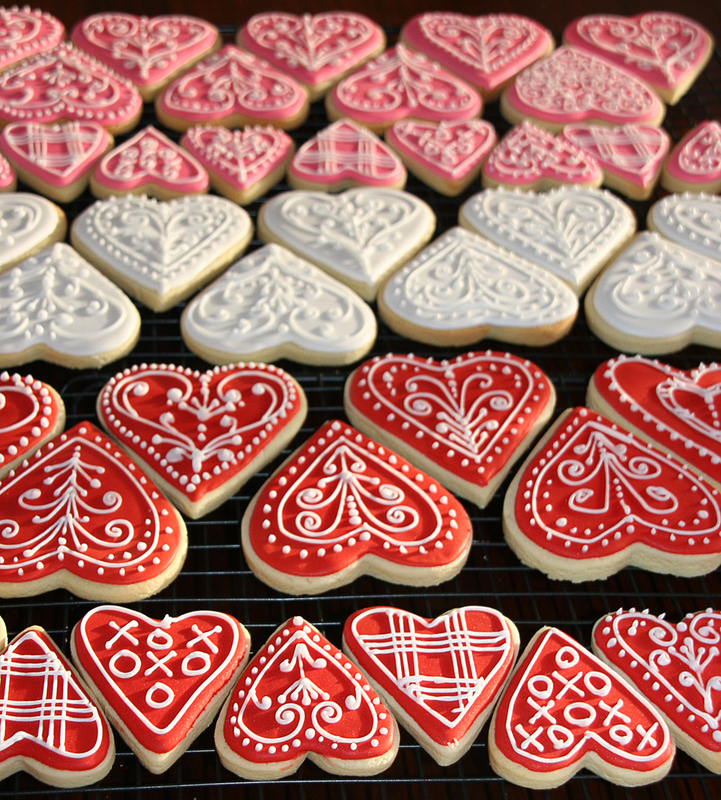 The template will also help all the cookies to look identical. Use a squeezy bottle with a large round hole number 3, 4 or 5 tip. Filling one area at a time quickly zig zagging back and forth. Don’t worry if you haven’t filled in every spot: speed is more important at this point. To fill in these little missed bits just use a cocktail stick to push the icing into your missed bits. 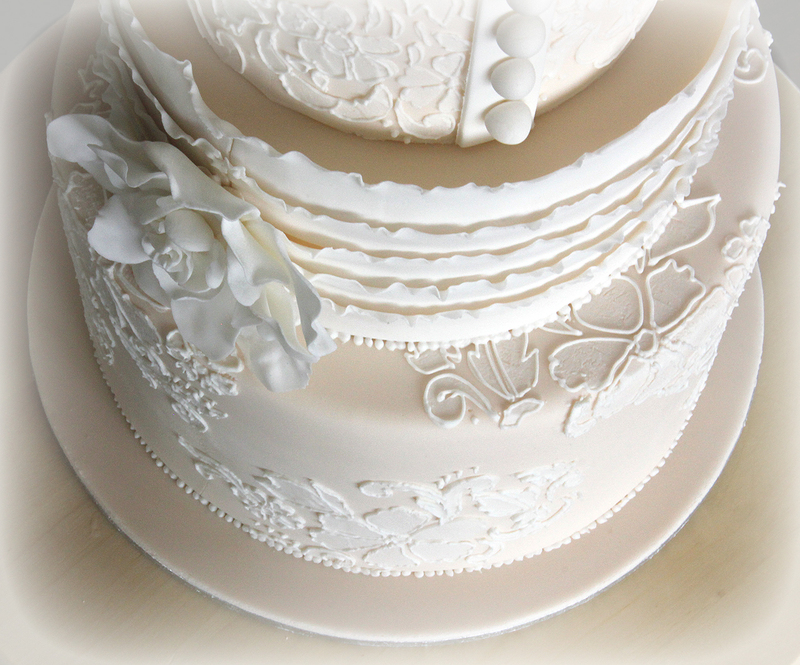 Use the thick icing in your piping bag to outline the top of the wedding dress and add a fancy little design. 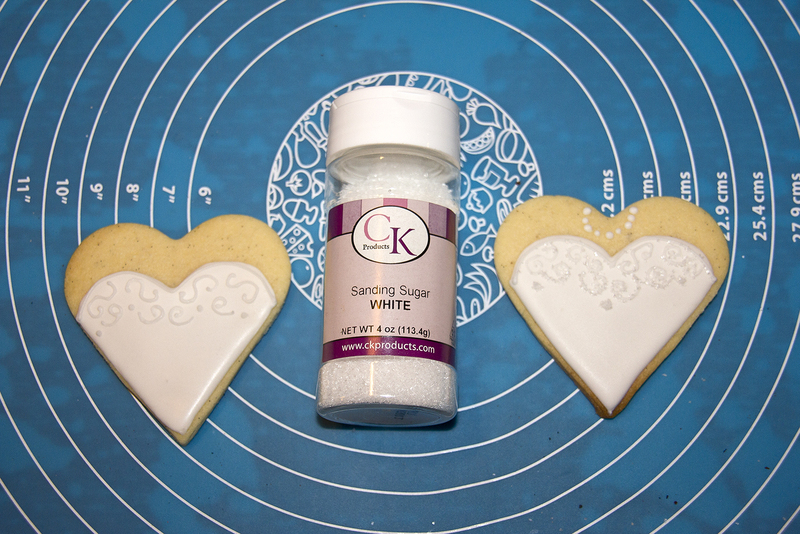 While still wet sprinkle over with white sanding sugar then pipe some dots for a pearl necklace. 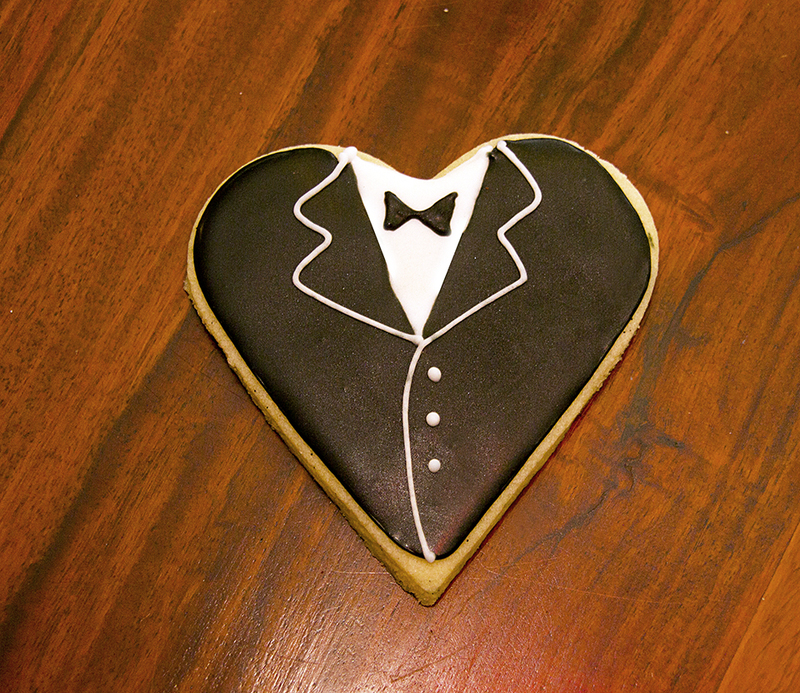 Use the same principles for outlining and flooding the ‘Groom’ cookies. Let the cookies dry for 24 hours, if you possibly can, before you package them. Store in an airtight container in a cool dry place out of the sun (sunlight can fade your coloured icing, especially black icing). 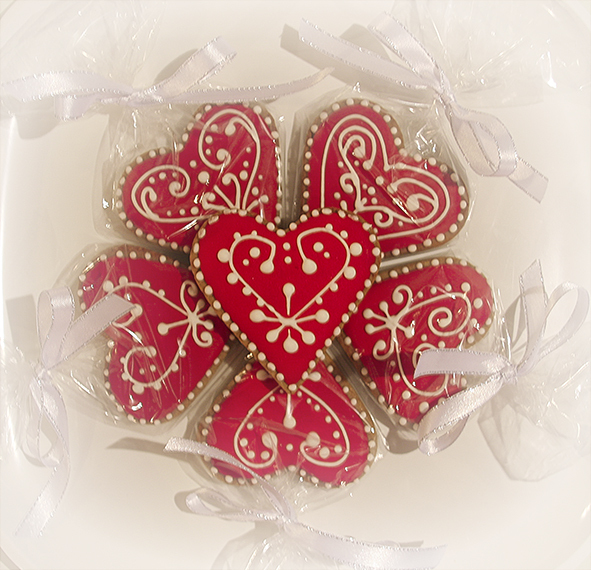 The cookies can be kept for up to 2 weeks and longer if heat sealed in food grade cello bags. 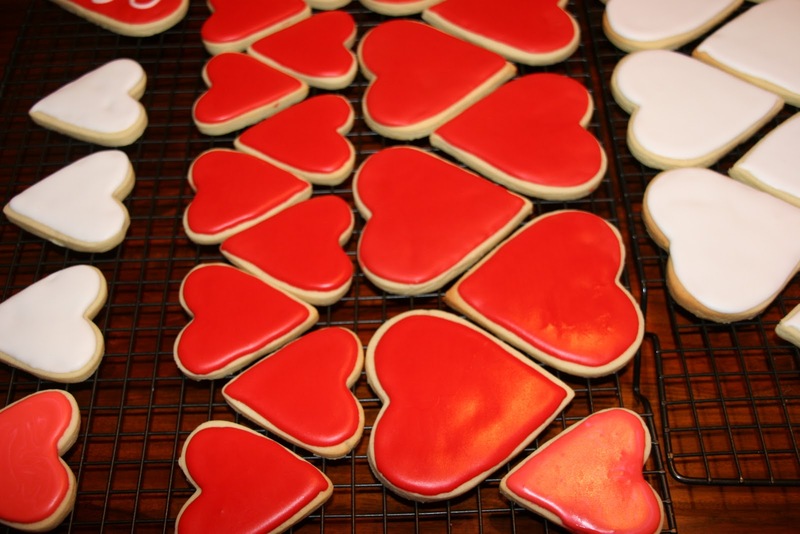 This year I made my Valentine Heart Cookies from gingerbread. I did this as I will be selling them at Pottsville Beach Markets on Sunday 5th February 2012 and the biscuits will have to keep for a couple of weeks. Gingerbread easily keeps for a month in cello bags and is my best choice but if you would rather make a Buttery Sugar Cookie recipe then click here. Gently heat butter, sugar and syrup until dissolved.. Cool slightly for five mins. 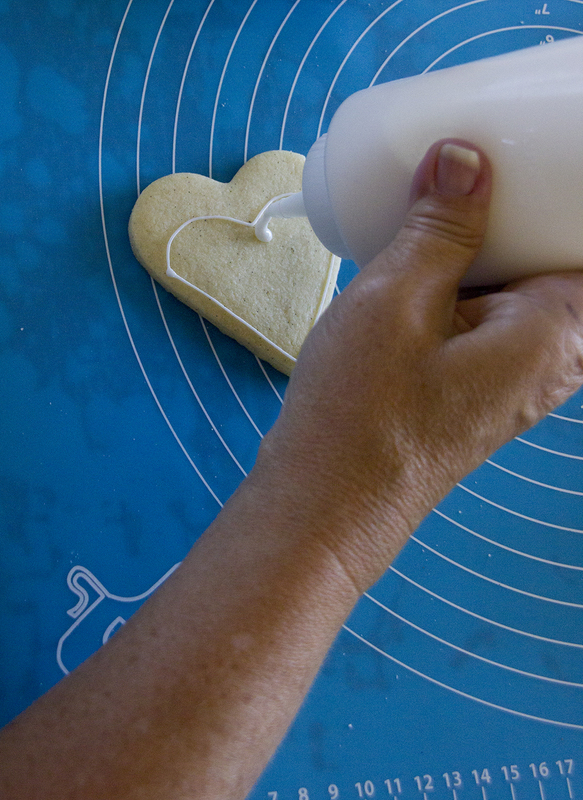 Sprinkle work surface with flour and roll out the gingerbread to 3mm (1/8in). 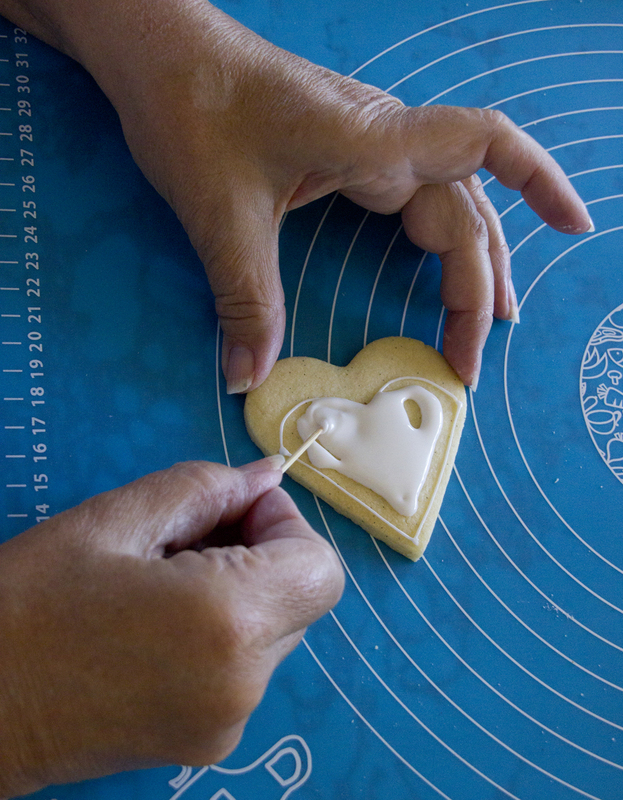 Outline and fill the cookies at the same time using RI (Royal Icing) with a number 2 piping nozzle and remember that RI takes 24 hours to set. Traditional royal icing is made with real egg white, however, because of the slight chance of salmonella poisoning, I now prefer to use dried egg white instead. Mix egg white and water in a bowl until smooth. Sieve the icing sugar into a grease free bowl. Tip in the egg mixture and beat on the slowest speed for 5 mins until the icing stands up in peaks. Planet Cake Royal Icing using real egg whites. Beat icing sugar, acetic acid and egg white with electric beater on medium-high speed for 4 minutes for ‘soft peak’. Add extra sugar if the icing is too soft. 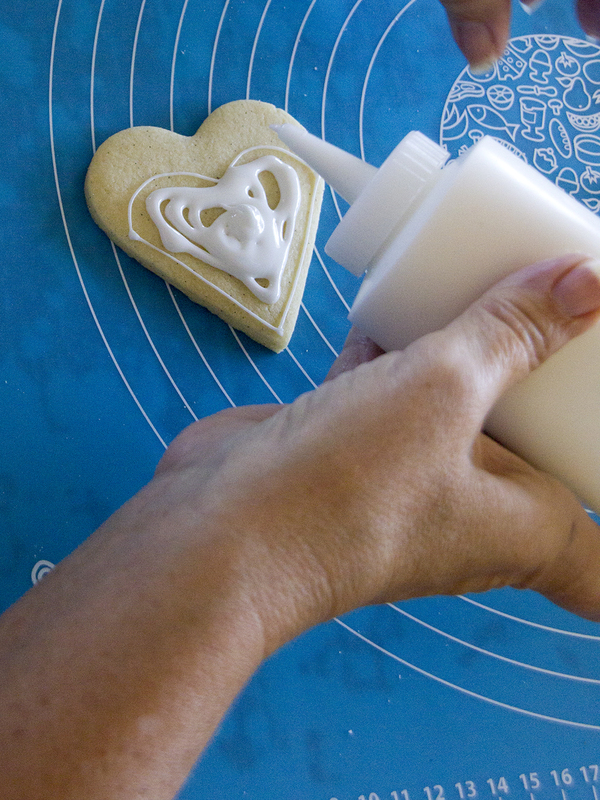 Achieving the right consistency for Royal Icing can be difficult but practise makes perfect, so if icing is too thick or too thin just empty your piping bag and add more water/vinegar or icing sugar. You will soon work it out. Place icing in airtight plastic bowl with a lid. Lay a piece of cling film directly on top of the icing and replace the lid. DONT put the cookies in an airtight container until they are set (24 hours to set) need the air to help dry out. Pipe on your designs once the cookies are set using a number 1 piping nozzle. 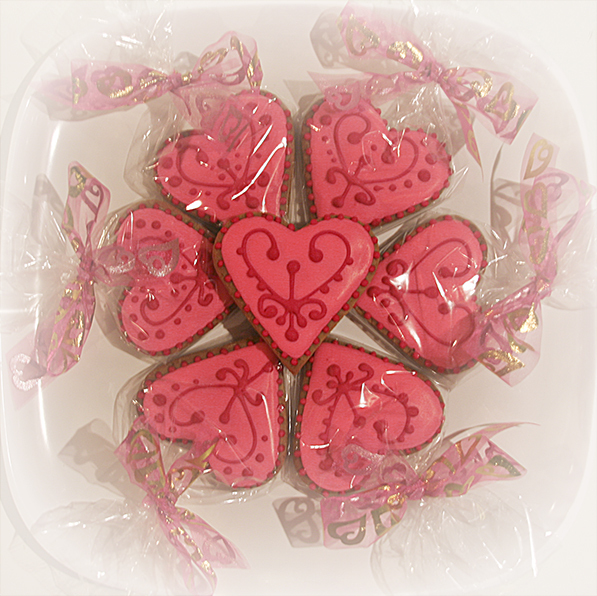 If you would like to use my designs then click on the image above to enlarge and then copy the same or similar on your cookies. For the straight lines, in particular, touch the cookie with the nozzle at the beginning and end of line only, pulling your line of icing in the air. This way you get the straightest line possible. 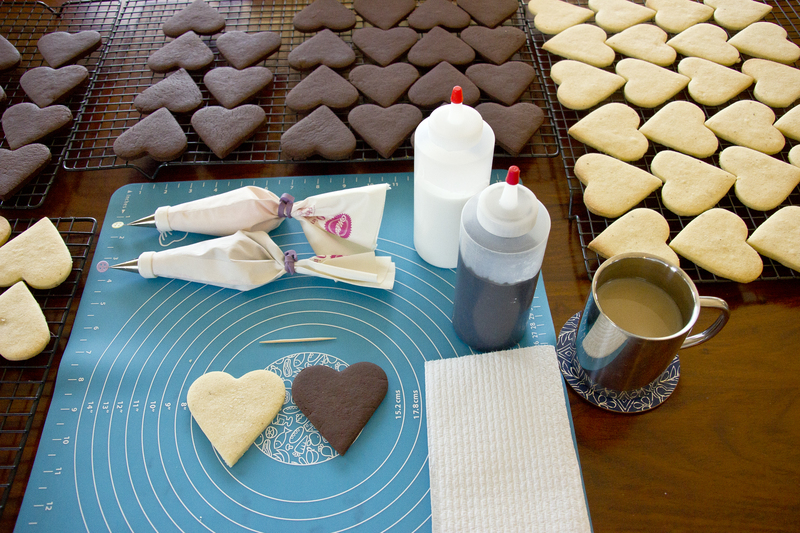 For the heart-shaped outlines you sort of hold the nozzle above your cookie and let the icing gently fall/glide into place. Do not drag the nozzle along the cookie surface at any time. Very few of my cookies are identical as I adapt my designs as I go. Feel free to experiment. If you would like to make these cookies using a Buttery Sugar Cookie recipe then click here.